Here is an entirely gratutious photo of El Ojo De Agua, about a half-hour walk from here. This really is a very small town – and you have heard all the jokes about small towns. The night before last, at the end of a long afternoon, just before twilight, there was An Incident here. Our little rancho, El Pedernal, has two streets lined with houses. We live on the main street, the one you go straight down when you turn off the main road, the carretera. A couple of decades ago the streets were paved, so we no longer have a rocky street, but we do have two topes. These are humps that cross the road to slow down traffic. In the evenings people tend to come out into the street to visit, and on the weekends maybe to buy a taco, tamal, or a snack. (And of course, there are the everpresent nightly borrachos, drinking in front of the store across the street). Someone had gone for his wife, and she and a grown son walked up to where the truck was parked. It was a rather busy time for local traffic, it seems, and every time a car or delivery truck would try to get around the black pickup, the driver would move it so that no one could pass. The streets were lined with more people, as if for a parade., but I noticed that nobody wanted to approach the truck. Soon his wife reached the truck, and she stood there for a long time. The word filtered back to me “He’s asleep in the truck, with his arms on the steering wheel”. And “Even his strong son can’t get him out.” There were quiet discussions about what should be done – call the police? tell the local delegado? In the end, not surprisingly, nothing was done. I never heard the outcome. This entry was posted in rancho life in Mexico, retirement in Mexico on August 27, 2011 by gubabbaboy. We are professional musicians, and every year for the last 23 years we have done a special show in one of Los Angeles’ oldest restaurants, La Golondrina, on Olvera Street. We left Guanajuato on a Monday. We had changed our flight date from Friday because we needed to be there overlooking the construction. We had also thought that more of our things were arriving from Nogales, and the workers were about to start digging for the foundation of the new room. Chon wanted to be there to make sure they really started, partly because a niece, Irene, had been criticizing them and us every time she passed by. We weren’t sure if they would keep working. The flight was the early one we usually take when we leave the airport called El Bajio in Leon, and we arrived in Tijuana about 8:30 a.m. We tried a new bus company to get to LA. There are several that specialize, it seems, in taking people across the border (nearly all Hispanic, although once there were ten or twelve Italians traveling on our bus). The bus stops at the border and discharges all the passengers, then we get picked up again after going through customs. This company, Coneccion Magica, had nice new buses, and the trip was unremarkable except for the fact that the bus stopped at their own loading spot only about ten minutes from the airport, then stopped again to fill up the gas tank before taking us to the border. After arriving in LA we walked about half a mile to an AVIS office and rented a gray Ford Focus. We drove to our house in Lake Elizabeth, congratulating ourselves on the fact that the car rental would be much less than staying in a hotel. We couldn’t get the mattress down from above the garage, so we made a bed on the living room floor with blankets and and pillows that were still there. It hasn’t been very uncomfortable sleeping there, warmed with an electric radiator-type heater. The first day was perfect fall-into-winter weather, but then a large tropical storm hit that has soaked the entire southland. At night the wind tears at the house and it’s a little scary when you are awake. A window was broken when we arrived, and we temporarily repaired it by cutting a sheet of foam insulation to fit the window so the cracked glass didn’t fall completely out. We also had an adventure getting the water heater lit: the propane tank was completely empty. We finally borrowed a large propane tank from a local mobile home manager – a long-haired guy who said “I don’t even know you guys, but I’m going to loan you my own tank. It has nine gallons of propane in it right now, and when you bring it back we’ll see how much it takes to fill it again, and you can pay me for what you used.” Pretty cool, man, but after Chon hooked it up outside we still couldn’t get the water heater lit. A cold bath later, I went and talked to the man again. He said we had to bleed the air out of the pipe before lighting it, and was very stern with me, telling me to really pay attention to his instructions. We followed them, and now we have hot water. And there was the deja vu factor – we had left some things in the garage, and it turned out to be much, much more than I had realized. So we have ended up unloading Foxy, our big Ford box truck, and bringing things down from the attic space in the garage. It’s a lot of work, and rather depressing at the same time. Since we have officially moved to Mexico I am more aware of how many unnecessary belongings we took with us. And there are more of them here, so we have the same decisions to make – toss it, deliver it to a thrift shop, or take it with us. We are both unofficial collectors of eclectic things, and most of the things we liked before, we still like. It’s difficult. Chon is entirely focused on searching for two bags that he has been missing since we drove to Nogales – a bag with a large collection of guitar picks, hand-selected over the years, and a bag of jewelry – watches, rings, chains, and more importantly, a small digital recorder with probably 180 original songs on it. We have discussed this loss endlessly, with heavy-duty speculation as to what has happened to the two bags. it’s all speculation, and trying to remember what happened the last hour or so (news flash!! Chon just found two, TWO recorders!! that were not in the famous two bags, after all) of that final day of packing, when we were exhausted. We just don’t know what happened to the bags. Our gig at La Golondrina is going well, even though attendance is low this year, matching the economy. The first night there were only twenty guests. The second night the entire restaurant was reserved for a family that has been attending for at least twenty years. There were over 50 children, and the place was packed. It was the Kilroy family and friends. This year Bob Baker is not performing, and I miss him, although he has sent a very talented young puppeteer, Eric. I love the marionettes. I have old, happy meomories of Bob Baker – when I was about twelve, I think, I saw the Bob Baker Marionnettes in a Community Concerts performance at MJC. It was the story of Hansel and Gretel, and I was thrilled. I remember the performance lighing was dark blue most of the time, and I remember the odd way the puppets moved, with that floating walking movement that they make. I seem to remember a grid where the puppeteers stood or lay down above the stage to work the puppets. Bob told me that it was his first big gig, and that he was very young when he got the contract. We have worked with him now at La Golondrina for about 23 years. He does pretty much the same show every year, which the return audience looks forward to. For the performance he uses recordings of familiar songs. There is a chicken who sings opera and lays an egg, a tap-dancing cat with a hat and cane, Santa Baby with Chon’s favorite puppet, a tall pink cat with a Santa hat, high heels, and a feather boa; there is a tall couple in red that tangos to Leroy Anderson’s Jealousy; there is also Mamacita, Donde Esta Santo Claus?, and El Jarabe Tapatio, a Mexican folkloric dance. I like to tell the audience that they know it was a good performance if your face hurts from smiling. Last night the audience was tiny (maybe 6 kids total), and the performance was very, very good. Three little girls dashed out onto the dance floor, after their original fear of the marionettes, and were twirling around, dancing with the puppets. For me it was magical! I never tire of the show. And it’s always fun to see kids reacting to the puppets – their reactions range from fear and delight (little kids) to feigned boredom (big kids). 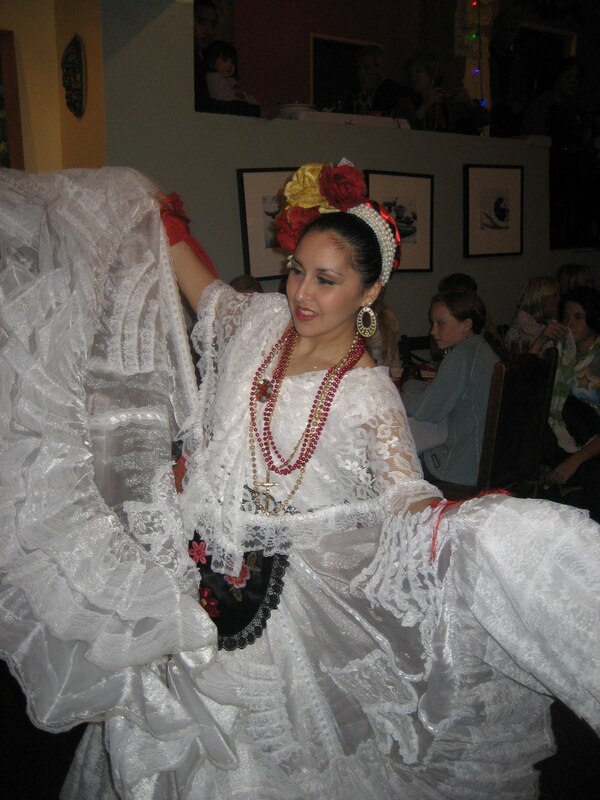 The performance at La Golondrina takes place on the dance floor. We invite the kids to come and sit around the edges of the area, and the marionettes get close to them. The tiniest non-shy children usually wriggle out of their parents’ or grandparents’s arms and run towards the puppets. The ones who follow the rules, usually the next -bigger ones, sit still and often hold out their arms in a beseeching manner. Sometimes a child will get distracted for a moment and then be startled by a marionette right in their face. The teenage kids try mightily to look bored, but almost always end up smiling and throwing sidelong glances at each other to see how their siblings, or friends are reacting. It’s interesting to observe the families that attend year after year. The first couple of years we were there it would surprise me to snotice familiar faces gradually. now I remember some of them when they arrive. We call the names of the children as they take their turn at the pinata. I remember some of the names: white-blonde Mia, her cousin Harper, Antonio, Conor, and Freddy. I suppose it’s that the names aren’t common these days. One evening I watched a large family. There was a grandmother and grandpa, both around my age – no, a little younger. They have three married daughters and eight grandchildren. The mothers were not as attractive as their parents, and one of them completely ignored me when I approached her and her sister, who were visiting rather intensely. I asked “Who are the mommies?” because the children were dressed exquisitely and I wanted to congratulate them. One woman said “We are,” and the other one just kept right on talking. I said how wonderful the children looked, but I doubt that either one heard me. And the children DID look great. There were six little girls, aged about 5 to 9. They all wore red velvet dresses. The dresses weren’t exactly the same; some had ruffles around the bottom edge, some were pinafores, but each dress and each little girl looked great. There were two little boys, too, wearing dress pants, white shirts and ties. The women weren’t as attractive as either their mother or father, But their husbands were rather doll-like and cute. The mothers did all the organization and took many pictures and talked intensely. One night there was a wonderfully nerdy boy (I use the term with full appreciation of the word). He must have been 10 or 11 years old. He had blondish hair. He was wearing glasses, and a t-shirt and sweatpants with tennis shoes. That separated him from most of the other kids right there, because they usually come Dressed Up to please their parents. This kid was very earnest, and began visiting with me right away, even trying to talk to me while I was playing and singing. Perhaps he thought I could add another skill to my musicianship. He wanted to tell me that I was “doing a great job”. Later on, when he was lined up for his turn to whack the pinata, he noticed that we asked each child his/her name and announced it on the microphone when they were taking their turn at the pinata; he caught my attention, and said, importantly and confidentially at the same time, “By the way, my name is Sean.” When it was his turn about four kids later, his glasses were nowhere to be seen – I assume he took them off so they wouldn’t be in danger of being broken. Another boy, another night, named Charlie, was just so – confidently boyish. He loved the music, and would dance unabashedly to any type of rhythm. He must have been about 8. He hadn’t yet reached that time when he will be embarrassed to dance with his mother or other kids, pick up a small child, laugh at the marionettes. While we are working there they give us a meal every night (an especially good thing this year since we are camping out here at our house with no stove or fridge!). Years ago the food wasn’t nearly as good there as it is now, and we sometimes tired of it. But now, Chon usually orders Enchiladas Suizas, chicken enchiladas with green sauce and sour cream, and I change around – Chicken Salad with a great vinaigrette (with a touch of chile!) or Tortilla Soup, or Beef Soup, or Tacos de Machaca (shredded beef). It’s all quite good. We have known most of the staff there for many years and it (almost ) seems like a family. Well, better, really, because everyone is on their best professional, friendly behavior. There is usually quite a bit of catching-up to do, hearing who had a baby, or who moved, or started taking new English classes, and the like. Well, the final night, Christmas Eve, my voice was pretty much gone. I sang the Christmas carols anyway, sort of. Chon set the sound so my mic was very hot, and the voice I heaqd sounded a little like me. Chon did much of the talking that I usually do, and we made it through the night together. Here’s a photo of part of our performance set-up. A few comments about Chon’s skills: he is a very skilled musician. He doesn’t like to say he is gifted – he says that he has worked hard to be at the level he is now. Anyway, he is also very, very good at managing sound, something most people just take for granted. At La Golondrina, first of all, he must consider the space itself. The restauarant is all hard surfaces – wood and concrete floors, and brick walls. Chon is given cassettes and CD’s and CD player by the dance group and Bob Baker for the puppet show. They either have not been well-recorded, or are being played by a not-so-high-quality CD player. Chon changes the equalization for each act, and often in the middle of a song to make each performance sound better. He also does this for us, adjusting the sound and volume of my keyboard and our voices – all without missing a note, while we are performing! This entry was posted in Bob Baker Marionettes, La Golondrina Restaurant, Olvera Street, Olvera Street Christmas, posadas, professional musicians show on August 23, 2011 by gubabbaboy. Most of the people in our town range from lower middle class to very poor. They are all working-level people with well-proportioned bodies perfectly fit for labor. In general they are smaller and shorter than us gringos (Anglos), as I like to call us. I often wonder at comments made in the US about hispanics being “lazy”, and even “dirty”. I have not observed any lazy people. Everyone works, with the possible exception of teenagers who don’t attend school, and old, old people. And the only “dirty” people I have seen are homeless. The most humble clothing is usually immaculate. Their skin is brown, shading from pale to very, very dark. Children here are generally quite beautiful, and tend to be at their most attractive, in my opinion, until around age fourteen or fifteen. Their bodies are mostly bone and muscle into middle age. 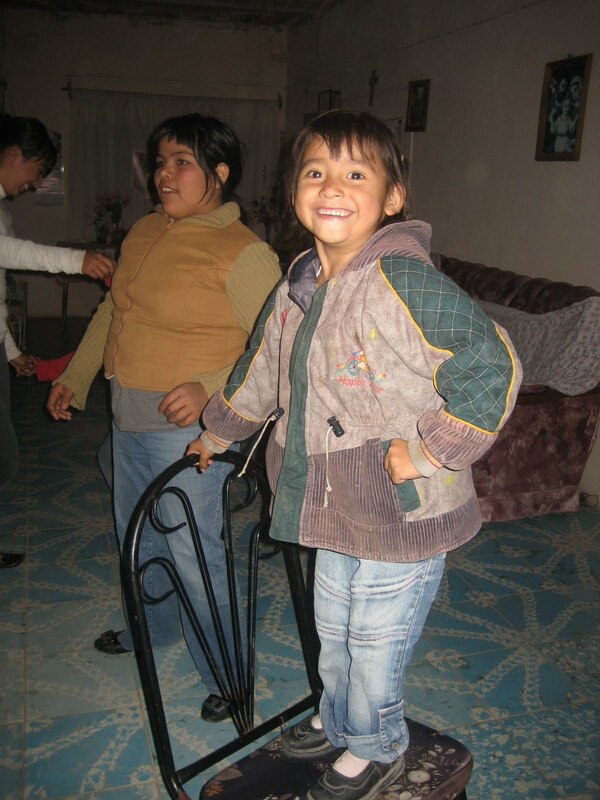 Women do the bulk of the housework, which in many Mexican homes is extensive. From the early-morning sweeping and mopping to hand-washing many pounds of family clothes and blankets to cooking and cleaning for large families, it’s heavy work. Free time is often spent repairing clothing and doing fine handiwork (mostly crochet around here). Many men work outdoors, doing the kind of work that machines do in California. When doing manual labor, men often sensibly break up the work day into two periods. At our house the two men who are building with bricks begin at about 7:30 a.m. as a kind of warm-up. At 10:30 a.m. they stop for breakfast. After that they work until about 4 p.m. They make building plans, carry cement, lay bricks, and dig and pry large stones out of the dirt. They have cut dowm trees, chopped them up and carried them in a wheelbarrow. They work very steadily. In the fields, teenagers are often hired to spray herbicides and insecticides, walking down planted rows. The men who work for the water company do heavy manual labor, providing new connections for the water that comes from the main, chopping through asphalt and concrete. Some men cut and sell firewood. Others work long hours irrigating or herding cattle. On the street we often see women passing with very small children. “Pre-kinder” boys and girls are often sent to the small stores to bring home purchases for their mothers. From pre-kinder to “secondary” school, all students wear school uniforms. There is, by the way, no separation here of church and state – during school hours there are unison prayers, and there are many references to God in the school and of course in everyday conversation. The schools are quite good, and the level of education is high. Students from Mexico who transfered to the local California high desert high schools invariably entered higher levels than the ones they left. Education in Mexico is “free”, although there are costs involved – there are inscription fees, and book purchases, and families are asked to co-operate for building improvements and other costs. The levels are Kinder (ages 4 and 5), Primaria (6 – 11), Secundaria (12 – 14, Preparatoria (15 – 17), University (18 and up). Most clothing here would not be noticably different from what is seen in most communities in the US to the casual observer. Colors and textures may be different, but many brands or knock-offs of recognizable names are very popular here. Mature women here usually wear dresses or skirts and blouses with sweaters or jackets, depending on the season. Many grandma-age women cover their heads and shoulders with long shawls or rebozos, usually in dark colors. It is not considered appropriate for mature women to wear white or light colors . Common color choices are black or navy blue. Curiously, I don’t see much brown. Teenagers tend to stay in gender-selected groups. Boys stand in the street, sometimes drinking, mostly always laughing amongst themselves, showing off, and waiting for the girls to pass by. And of course, the girls do pass by, by twos and threes, talking seriously or giggling, usually On Their Way to somewhere – a friend’s house, or to mass. There is a tendency to marry young here. Many families seem to force their female children out of the house, and this naturally is hurtful to the daughters, who at one time were cherished and cooed over. The anger the girls must feel gets channeled into the new relationship. If the parents of the young couple don’t approve of the union, the boy will often “steal” his girlfriend. In years past, the stealing was real – a kidnapping that may or may have not been consentual. The couple would stay together for a night or a week, and when they returned, the parents would hastily arrange their marriage. Soon the married girls lose their shiny attractiveness and they become subdued, squarish and very much like the very mothers they rebelled against. Their lives become nearly the same as their parents’, and not the glamorous, appreciated roll they dreamed of playing. In our little town there are two girls that I knew when they were girls; just little girls, with little girls’ adorable sweetness and curiosity. They came here to our portål to see me, the exotic outsider; to read or listen to books I had brought with me. They are still girls in one sense of the word. Barely adults, they were “stolen” at the ages of twelve and thirteen, and although I see them occasionally, I strain to see the sweet, giggling personalities behind the dull eyes and slack bodies. They have their own babies now. One of Chon’s aunts was stolen; truly stolen long ago, by her boyfriend’s best friend. Her life “turned out” well, and her marriage was probably at least as good as many. Recently, during the same weekend, two girls were “stolen” here in our town. They showed up a few weeks later, with their husbands. Parents of these couples generally hurry to get the youngsters married in the church whenever possible. This entry was posted in Uncategorized on August 18, 2011 by gubabbaboy. When you are need of workers, you don’t need to do much – they will find you. When we were in our fields struggling to control the Johnson grass, several men came to offer their services. The first one was Peña. He came on his bicycle, and after the customary catching-up and joking around, he slid into a conversation about the farming. Peña is a very short man. he is not a Little Person, but he is really very short. He demonstrated how he would spray our weeds for us, walking around and miming holding a sprayer in his hand. Chon and Peña were friends long ago, and Peña’s nickname comes from a talented soccer player on the Mexican team years ago. Soon another guy came on his bike, with his little boy on the handlebars. 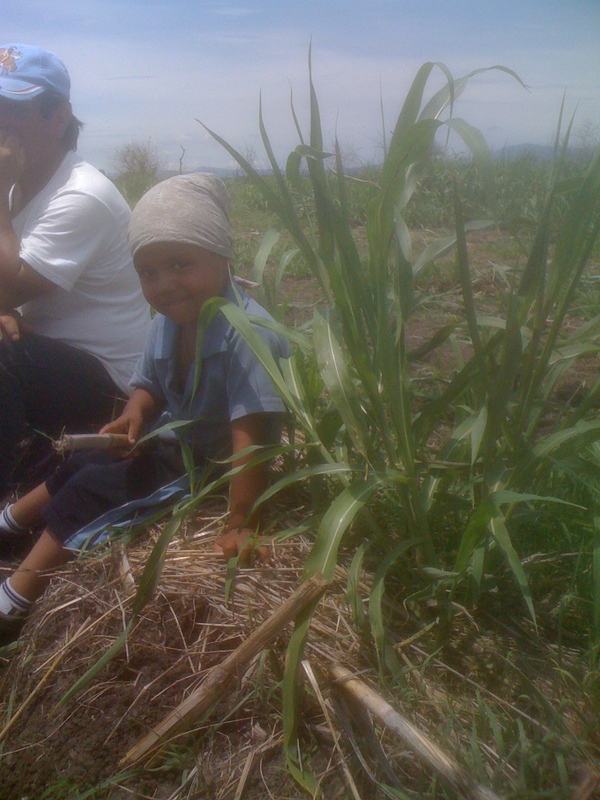 He was interested in the work, but he mostly walked about hunting for worms (plaga) on our mIlo plants. It seemed as though he wanted to bring our spirits down, or maybe just to show off his ability to find problems. A day or so later, another guy came bicycling out to us. He was Don Andres. He looked like the friend-turned-enemy bad guy in an old western. He got right to the point – he wanted work. He needed work, and he was the guy to do the work. Instead of hiring a tractor to spray our weeds (it was absolutely necessary – they were growing faster than the milo), we hired Peña and Don Andres. From our point of view, it was a good move. The tractor would have finished the spraying job in a half-day. It took the two men nearly two weeks. But, we figured, we were investing money in the town, and not in a big-time farmer and his equipment. As the days went by, we were impressed by the work the two men did. Now we are patrones, and every morning we go to the fields to manage our little crew of misfits. For days and days we filled and hauled barrels of water to the fields for the weed spray, stirred and mixed the spray. The for two more weeks we took 100-pound bags of ammonium sulfate granules and place them strategically in the field so the workers didn’t have to go too far to fill up their bags (called morrales). Being a patron (or a patrona) means you have peones working for you. That’s a word I’m having to learn to be comfortable with. But the peones are comfortable with it, even sort of bragging about their years as peones. Chon is really good about deciding where each person should work, and about giving authority to some. He has to be very diplomatic. Right now Peña the very short man, is working with Don Andres, the man with a limp. Peña seems to sort of look out for Don Andres, filling his morro for him, and adjusts his own faster, steady pace to Don Andres’. You can see the two of them trudging along together, Don Andres’ head bobbing, and Peña floating along smoothly. There are some benefits in working the fields that just can’t be described in words. The other two workers are brothers. The older one, Jose Santos, is called El Hombre Lobo because he has a rather hairy face, with a short full beard. I don’t know his brother’s name. They worked together in another part of the field. But then we had to tell the two brothers not to come – the 10 bags of fertilizer we were expecting yesterday did not arrive, and we drove to the business about 8 miles away to see why. Their delivery truck had broken down, and there were several anxious, angry farmers there. Anyway, this morning we took the seven bags we had out to Peña and Don Andres. They are working now. The fertilizer should arrive shortly for tomorrow, and the brothers may show up to throw some today. They seem to prefer to start work at a later hour anyway. Here at the house, the two bricklayers are getting ready for a big colado. The tejaban is up, with all its pieces fitted together. Tomorrow they will put a comparatively thin layer of cement on the top. We are hiring twenty-some guys, selected for their various strengths. The ones who are strong enough (they seem to be the most irritating to the rest of the workers) are put to work on the bottom, where the work is the heaviest. Chon hopes the hard work will keep them busy enough not to piss off everybody else. Short little Peña is working too, (he’ll make 50 pesos more than if he were working in the fields) and this morning he said he’s a little nervous about it because he’s so short, and most of the other guys are young (they call them nuevos when they are young) and strong. Don Andres will work with the fertilizer. The guy in charge of the colado says Don Andres just wouldn’t make it through to the end. For the colado we have to do our part as patrones – we have to fill the water barrels today, before the water goes off at 1:15. There are three barrels to fill, plus the heavy tank we use for our baths. We have to supply beer, lots of it, usually served about half-way through the work. Chon says the workers are coming at 5 o’clock in the morning! That means I have to get the truck with the load of fertilizer out of the parking yard because there will be ladders and other things blocking the driveway. So in a little while we are going to town. We will try to see the lawyer, who wasn’t there when we went two days ago, and buy a carton of large beers, and get a contract printed, signed and mailed to the property manager of our rental house in California. He had lots of bad news for us. Besides the new paint and carpet, there are major plumbing problems: the bathtub leaks into the living room below. The pan in the shower is weak and wobbly, and the downstairs toilet is cracked and un-useable. When it rains it pours. Hope it rains here in the next few days – there is a saint festival in the little town on the other side of the road, and they say it ALWAYS rains on August 7th, the day of their fiesta. This entry was posted in farming in Mexico, retirement in Mexico on August 17, 2011 by gubabbaboy. Not every house has a TV, but it seems like just about everyone has a radio. Doña Elena next door has a radio that she turns on around 6:30 a.m. Because of the design of her kitchen, the sound is amplified and is easily heard on the street, for the morning sweeping ritual. She turns it off at 8 because the progamming changes from the rancheras that she likes, to a different style. In fact, when the programming changes to “banda”, she ruthlessly turns off the radio mid-phrase. Doña Elena has a favorite song, Que Me Lleve El Diablo, and whenever it is played, she sings – very loudly, and tunelessly – in her yard. The radio stations in Mexico are of different types, just like in the US. There are stations that play modern pop, some that play banda music (imagine a German tuba band playing music in Spanish), rap and dance music, cumbias and other Latin dance music, mariachi music, talk stations (mostly pro-goverment), etc. The style of music that I most like to hear on the radio is ranchera. There are beautiful songs and some very good voices, from the forties and later. Another wonderful genre is trio music from the forties and fifties. The songs are very much like what are called standards in the US, with gorgeous extended harmonies. They are composed and performed by male trios with very, very good guitar playing. The sixties and seventies in Mexico produced excellent pop music. Much of it originated in the States. Imagine hearing, in Spanish, Twist and Shout, Going To The Chapel, Tan Shoes With Pink Shoelaces, The Name Game, With Just A Hundred Pounds Of Flesh, I’ll Do My Crying In The Rain, Won’t You Be My Baby! I recently heard Neal Sedaka sing in Spanish Next Door To An Angel! Many excellent songs were written during these years in Mexico, Spain and other Latin American countries, as well as Italy. After Doña Elena turns off her radio, we turn ours on, and at about 8:20 every day there is a dramatic serial called Porfirio Cadena – El Ojo De Vidrio, from the fifties. Imagine the announcer with lots of echo and effect introducing the program. The story is described as “violent, audacious, etc.” It is an episodic story about a (in)famous (imaginary) bandit. He is called El Ojo De Vidrio because he has a glass eye. His entire family was killed by a traitorous acquaintances when he was a child. He saw the killings, and afterwards the killers tortured him by cutting out his eye with a sharp branch. Porfirio lives to take his revenge on his powerful enemies, and accumulates an enormous treasure. The character seems to soften as he ages, but when he is young, and beginning his career as an outlaw, he is cruel and violent, although fair, wreaking his own concept of justice. At night, at 10:30 p.m. the same station plays another serial adventure called Caliman, El Hombre Increible, the incredible man. The current story is called The Black Widow. The voices of the actors are quite dramatic, typical of the fifties, and both serials are very entertaining. The sound effects and the incidental music are wonderful. After each episode ends we speculate about how Porforio or Caliman will escape from his most recent capture or predicament, and what is happening with the other characters. There are annoying commercials, just like on the radio stations in the US. I particularly dislike hearing childrens’ voices say “Wow!” and continue in Spanish. The government touts itself in endless commercials, bragging about “transparency”, “equality” and “fairness”. There are many ads for drug stores, and for natural health products, which are very popular here. This entry was posted in learning Spanish, popular songs in Spanish, retirement in Mexico on August 16, 2011 by gubabbaboy. Now I know how to say it doesn’t fit, “No cave,” and it didn’t fit, “No cupo”. You can get through many conversations by using “Si, verdad?” or “E,” (meaning you agree), or “Asi es”. Nobody wants to hear your opinions much, anyway. And it’s polite to just agree even if you don’t. I find that custom extremely interesting, and rather difficult to perform. There are quite a few words that many people know here that are not in the dictionary. There is a bird here called “tutubisi’”. It looks a little like a mockingbird, and it lives in the trees around the farmland. It must be some kind of flycatcher. There is a frightening, quite large black wasp-like creature that people here call a Juan Sanchez. Their stings can feel worse than scorpion stings, they say. I knew that maiz was corn. And people talked about “sorgo” or sorghum. But I didn’t know that “maiz nilo” was the same as “sorgo”. Maiz nilo – cornes from Egypt – the Nile. Sorghum. Sorgo. Miaz Nilo. I had a big “aha,” moment about that. Everyday Spanish uses a verb form that English speakers have mostly dropped. It is common now to hear people say “If I was going to be here,” “If I was you,” etc., although I’m sure high school and college English teachers struggle to correct and educate their students. Anyway, in Mexico I hear even children using the subjunctive mood “If I had done this…”. It is used to express doubt, uncertainty, and judgement. “I want,”, I hope”, “it’s probable that”. At least I can hear it now, even though I probably (there’s a subjunctive mood right there!) will not use it correctly myself for some time. 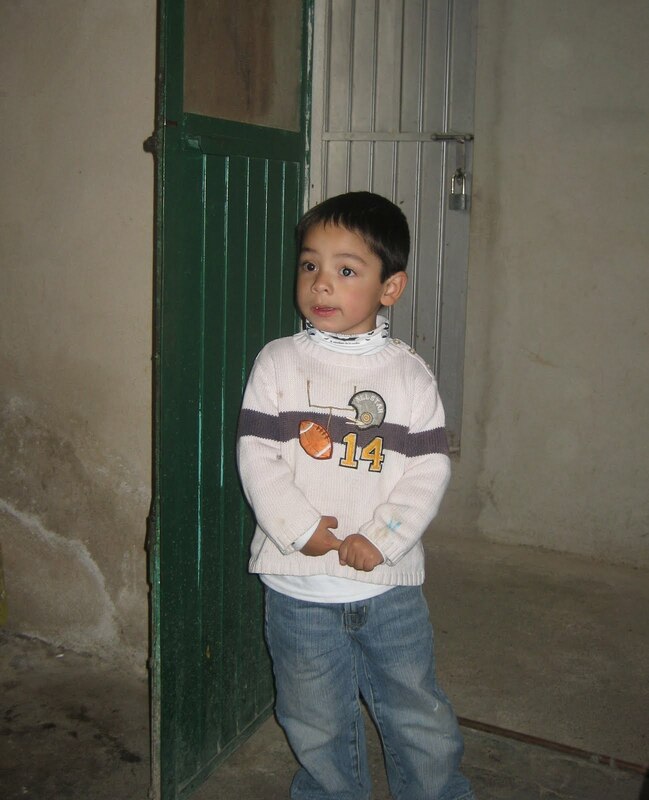 This entry was posted in learning Spanish, retirement in Mexico on August 15, 2011 by gubabbaboy. If you have done any farming in the US, you know what it is. Even if you don’t realize it, you’ve seen it – big clumps of grass with plumy seed heads in the summer. 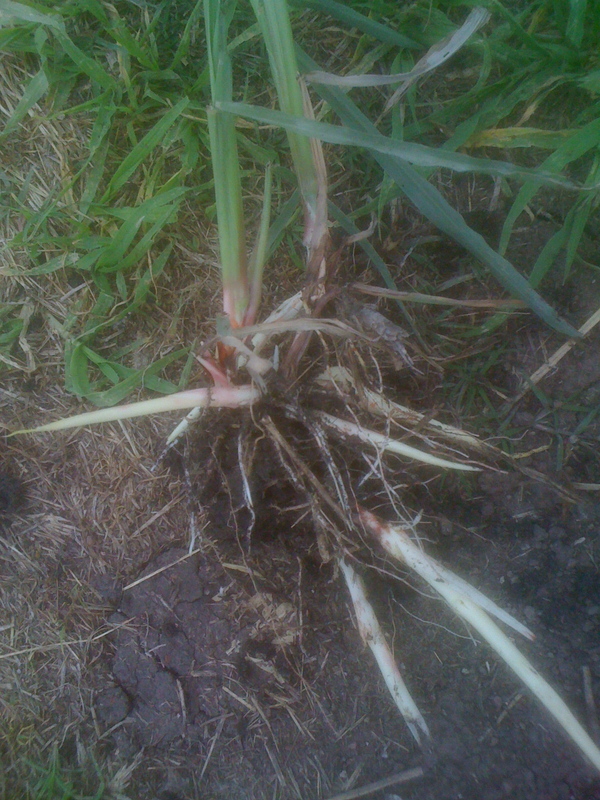 This is healthy young Johnson grass – no seeds yet. We walk to La Tabla Grande (each field has a name here!) with a borrowed shovel. Maybe it’s a spade – it’s the only shovel around here that isn’t a flat for-shoveling-gravel one. It’s about 6 inches wide, and maybe 20 inches long. The sun is shining and it promises to be hot. But, oh, it’s so beautiful here walking along the tops of the fields. Green and blue and brown and green and blue and brown. Hills and fields with houses in the distance. A bright red bird. We pass one field that looks like all weeds. It’s been replanted, but it looks awful, although the little plants are visible in their rows. We pass another one that there is much speculation about. The owner is famous for using and over-using chemicals. They say he has spend over 50,000 dollars, not pesos, on his lands. So far. Some fields look “clean” and healthy, some have puny plants. 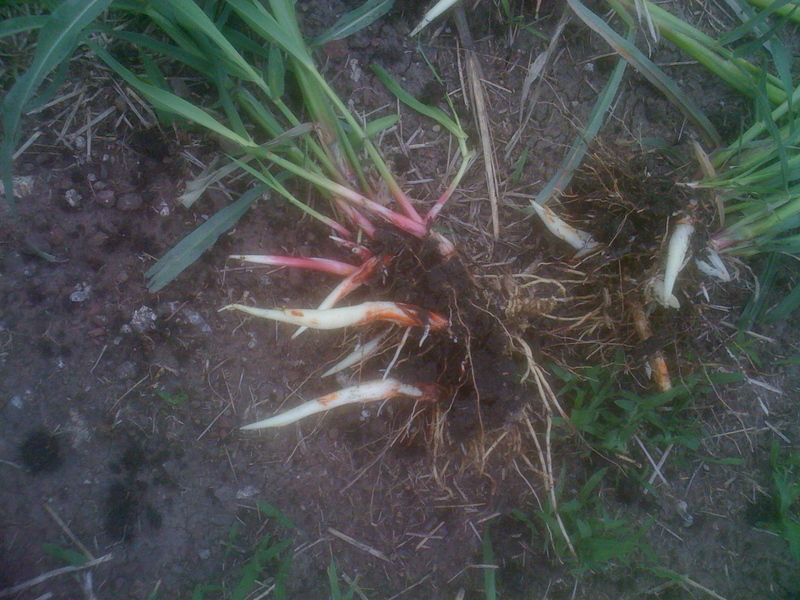 We start digging the Johnson grass that has invaded the edge of our field. It’s tall and in clumps, and it grows all the way to the bottom end of the field. Here’s how we do it. The person lucky enough to be doing the digging digs close to the clump of grass. Since the blade of the spade is so long, you have to raise your leg pretty high, then really put your weight on the top edge of the spade, and send it as deep as you can into the ground. The person lucky enough not to be doing the digging picks up the big clump – it’s hard and sticky, like a huge, heavy black wad of gum, then bangs it on the ground (not very effective) or the knee or leg (effective, but increasingly painful). Then the grass with a little bit of sticky dirt still on it gets heaved onto the road. In one spot where the grass is thickest, Chon decides to dig deeper, because he is sure there are more roots down there. He uncovers what he calls a nest of roots. It’s thick and knotted, and it’s about a foot and a half under the surface. He digs down further and finds more roots. They are very thick, about as thick as a child’s finger, and very white with pretty pink streaks. They look frighteningly healthy. He digs some more, and he’s about two and a half feet down now. There are more. We leave them for another day. Later someone tells us the roots can go down two meters. I don’t believe it. We do this for two hours. We didn’t think to bring water or food. Ni modo. Next time. He says he’s tired too, and if he had to run for some reason, he’d have to think hard about it first. He puts the spade across his shoulders and hangs his arms over the handle. He says it feels like he’s carrying his arms on his shoulders. He is. At the house we eat tamales and zucchini flowers cooked with onion and tomatoes, feeling happy. Something to meditate on – they look good enough to eat, don’t they? Cows love ’em. This entry was posted in ex-pats in Mexico, farming in Mexico, growing dry-land sorghum, retirement in Mexico on August 14, 2011 by gubabbaboy.